Below is Thich Nhat Hanh’s translation of the Metta Sutta. This text plays an important role in Buddhist practice and is chanted daily in a range of languages throughout the Buddhist world. It took on additional importance for me two weeks ago. Those who wish to attain peace should practice being upright, humble, and capable of using loving speech. They will know how to live simply and happily, with senses calmed, without being covetous and carried away by the emotions of the majority. Let them not do anything that will be disapproved of by the wise ones. “May everyone be happy and safe, and may their hearts be filled with joy. “May all living beings live in security and peace: beings who are frail or strong, tall or short, big or small, visible or not visible, near or far away, already born or yet to be born. May all of them dwell in perfect tranquility. “Let no one do harm to anyone. Let no one put the life of anyone in danger. Let no one, out of anger or ill will, wish anyone any harm. “Just as a mother loves and protects her only child at the risk of her own life, so we should cultivate boundless love to offer to all living beings in the entire cosmos. Let our boundless love pervade the whole universe, above, below, and across. Our love will know no obstacles, our heart will be absolutely free from hatred and enmity. Whether standing or walking, sitting or lying, as long as we are awake, we should maintain this mindfulness of love in our own heart. This is the noblest way of living. 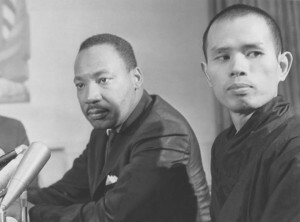 This entry was posted in Buddhism and tagged buddha, Buddhism, Jr., Martin Luther King, Metta Sutta, Thich Nhat Hanh, wedding by teachingasianreligions. Bookmark the permalink.